Traffic light powerpoint template, today, i'm only post a simple thing, about traffic light template. 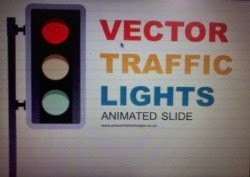 This template just show a traffic light, with animation on the lamp. red, green and yellow and without other animation. It's is sufficient for you if your work at road, or maybe you will presentation about work or a car. even without lot of animation, this template will good enough, simple and good looking.